1 x Clear Proximal femur precut to accept the Corail Size 11 stem. 1 x Hemi Pelvis pre reamed to accept acetabular cup 54mm. 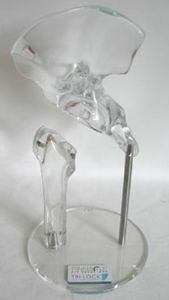 1 x Clear Perspex stand and location rod for hemi pelvis. 3 x Rubber anti scratch feet located on the underside of each stand. Each model is made to order. Look well, do the job, thank you.